Drivers spend most of their time in their trucks. From working to sleeping, the truck is home when drivers are over the road. At TransAm we understand the importance of having a good truck and want to provide the best trucks possible for our drivers. This is why we are a Kenworth fleet. What does it mean to be a Kenworth fleet? It means safety, comfort, and fuel efficiency. TransAm Trucking has top-of-the-line equipment. Each truck is equipped with automatic transmissions. Automatic transmissions are much safer for our drivers because they are easier to operate – especially in heavy traffic. We want our drivers to stay safe. That’s why we drive the Kenworth brand, ranked highest for customer satisfaction in three segments of JD Power and Associates heavy duty truck study. Along with safety, each truck comes with the comforts of home: dual bunks, refrigerators, and CD players. Radio more your style? Our trucks also come with satellite radio availability. Our Kenworths are also equipped with inverters so you can run your laptop, TV, and microwave. 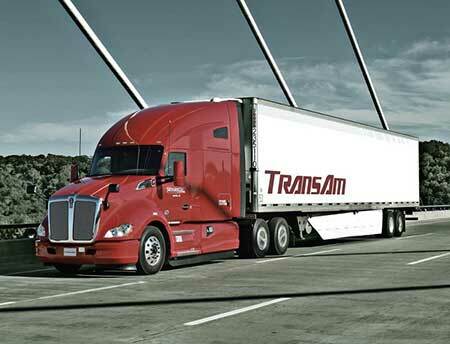 At TransAm Trucking, we are focused on making our drivers’ lives over the road more livable. All our Kenworths come equipped with Auxiliary Power Units (APUs). APUs provide heating and cooling when you are taking your breaks without needing to idle your truck. This provides beneficial fuel savings for our drivers. Our Kenworths also have PACCAR MX engines. Not only are these engine fuel efficient, but they are also environmentally friendly and quiet. For truck drivers, their trucks are more than just a way to get from place to place. They are also home when the driver is over the road. This is why TransAm Trucking is a Kenworth Fleet. We want our drivers to feel at home.